In many developed nations, the average number of children that a woman has in her lifetime is now less than two, falling short of the approximate fertility necessary for a generation to “replace” itself. 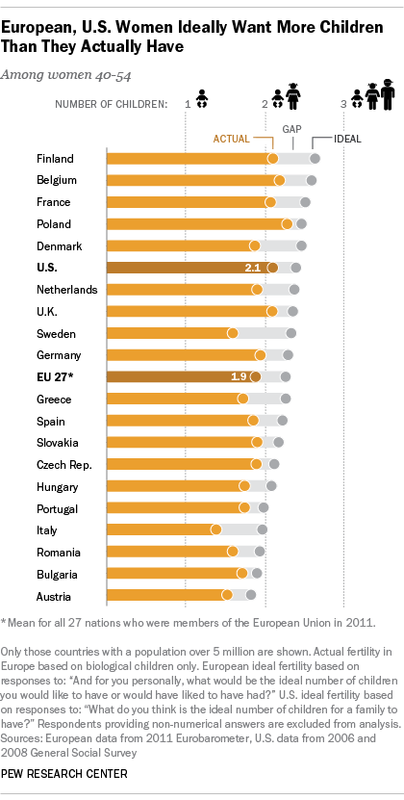 While there are many factors driving what some deem a ‘Baby Bust’ in Europe and—to a lesser extent—the U.S., a lack of desire for children is not among them. Fully 87% of women in 27 European Union (EU) member states reported that the ideal family size for them personally is two or more children, according to a 2011 Eurobarometer survey. Some 57% said that two is the ideal, and an additional 30% said three or more is ideal. These numbers are based on the 92% of respondents who provided a numerical ideal; the rest said that “there is no number, it depends” or said “don’t know.” Some 87% of EU men who had a preference also reported that their own ideal family would include two or more children. But when it comes to fertility, reality often doesn’t comport with the ideal. Among EU women ages 40 to 54, one-third reported that the number of children they actually have is lower than their personal ideal. This gap in ideal versus actual fertility varies markedly by country. In Denmark, fully 45% of women ages 40 to 54 reported that their actual fertility is lower than their ideal fertility, while at the other end of the spectrum, in Bulgaria just 18% of women near the end of their childbearing years reported that the number of children that they have is lower than their ideal. Fully six-in-ten EU women near the end of their childbearing years reported that they have the number of children that they consider ideal, and less than one-in-ten reported that the number of children they have is higher than their ideal. While the U.S. has been somewhat immune to the low fertility rates that have raised concerns in Europe, actual U.S. fertility also tends to fall below the ideal. Some 52% of American women (who gave numerical responses) said their ideal is two children, and an additional 44% said that three or more children is their ideal. (While 86% of women gave numerical responses to this question, 14% reported that the ideal family size was “as many as [someone] wants.”) But 40% of U.S. women nearing the end of their childbearing years have fewer children than their ideal. These U.S. results are based upon 2006-2008 data from the General Social Survey, which asks a more general question than that posed in the EU: “What do you think is the ideal number of children for a family to have?” Analyses suggest that this “general ideal” question elicits results similar to the “personal ideal” question asked in the EU, but nonetheless, caution should be used when comparing the U.S. and EU on these slightly different measures of ideal fertility. So what’s driving this gap between ideal and actual family size? Among others things, delays in childbearing, which may be caused by increases in educational attainment, or by the lack of a suitable partner, may play a role. Starting childbearing at a later age means that there are fewer years for a woman to meet her fertility ideals, plus it increases the risk of age-related infertility. It’s also important to note that “actual fertility” as defined by the Eurobarometer does not include adopted or step-children, and a small share of women near the end of their childbearing years may still have another child.